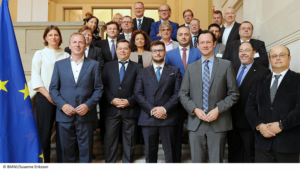 Cloud computing in the digital single market – joint meeting of European government representatives and label initiatives in Berlin. On 26 September 2017, the German Ministry of Economic Affairs and Energy invited government officials and national representatives of cloud initiatives from France, Italy, the Netherlands, Austria, Romania, the Czech Republic, Slovakia, Germany and the European Commission to meet up in Berlin. The meeting focused on the discourse about the pan-European harmonization of national initiatives to secure the European digital single market. The first step in this direction was the signing of a joint agreement between the cloud label initiatives Zeker-Online (Netherlands), Label Cloud (France), and Trusted Cloud (Germany) in December 2016. At this year’s CeBIT, the EU Vice President Andrus Ansip emphasized his strong support for the initiative, which for him is a contribution to strengthening the digital single market. Digital services are an integral part of our day-to-day life. On the one hand, the challenge remains to evaluate which of the providers and cloud services are trustworthy. On the other hand, the use of cloud computing is key to digital transformation and competitiveness of the European economy, especially for SMEs. For this reason, we support the development of cloud certification. The common goal for all participants is the promotion of the European single market for cloud computing. For this purpose, common standards should apply throughout Europe and will also be applied to other areas of digital platforms and services in the future. Andreas Weiss, Director of EuroCloud Deutschland_eco e. V. presented the current state of harmonization, which should also lead to the mutual recognition of national certificates for cloud computing. As a result of the harmonization, the much-needed guidance and decision-making support can be provided for SMEs across different European states.